~Beauty In the Storm ~: Know Yourself. Know Yourself WELL. Do you know yourself well enough to know when someone “mislabels” you? There will always be people out there who don’t get us. People who are jealous of us. People, who just, plain, don’t like us. I don’t understand it. I don’t agree with it. But it’s the reality of life. 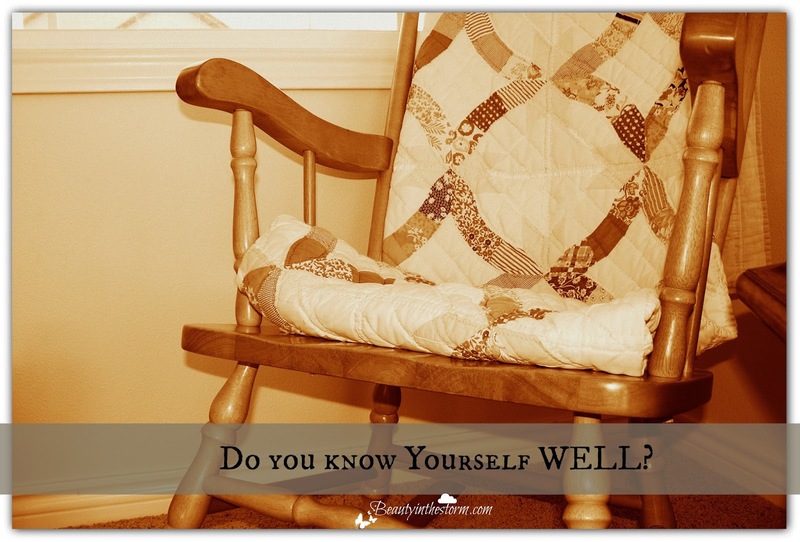 So, how well do you know yourself? How well do you know yourself when you find out lies have been spread about you? How well do you know yourself, when someone says something to you about how you act, or what they think of you… that is in contradiction to who you think you are? How well, do you know your heart, your soul, and your mind? We must know ourselves very well. We must know what we stand for. We need to know what we believe about ourselves, about humanity, and about life. We need to know our weaknesses and strengths. We need to know when to reject words and thoughts meant to shape us in ways that aren’t encouraging, or aren’t fuel to the fire in our hearts. Words that don’t motivate the spark in us that can impact the world in a better way. We need to know our giftings. We need to accept how we were made and how we are growing. It takes time alone to truly learn about yourself. It takes quiet, reflective moments to listen to what’s in our hearts and our heads. It takes courage to listen to what is truly going on inside ourselves – good – or bad. But we need to hear it. We need to know what rages inside of us. And we need to let it be molded into something that strengthens us into better people. Some people are really good for us. They are great at getting us to know ourselves better. They have a gift of investing into us, without chipping anything away. These are the people we need to surround ourselves with. They are gifts. You never know when your life will be taken for a spin. You never know when everything you thought you were, will be questioned, challenged, and confronted. So if you don’t already, get to know who you really are. Know what you’re capable of. Know what you want to be about. And then stand on it. Stand strong and sure. So that when the attack comes, you will know yourself well.